Part 2 of 2. Read Part 1 here . I have set limits to individual freedom. For each man in this state which I propose is fulfilling his own True Will by his eager Acquiescence in the Order necessary to the Welfare of all, and therefore of himself also. There is no creature on earth the same. All the members, let them be different in their qualities, and let there be no creature equal with another. Here also is the voice of true science, crying aloud: “Variety is the key of evolution.” Know then, o my son, that all laws, all systems, all customs, all ideals and standards which tend to produce uniformity, being in direct opposition to nature’s will to change and develop through variety, are accursed. Do thou with all thou might of manhood strive against these forces, for they resist change which is life, and they are of death. Corporatism also had a metaphysical aspect, being the basis of social organization in traditional societies, including the guilds of Medieval Europe and the corporations of ancient Rome. In traditional societies, guild or corporatist social organization was, like all else, seen as a terrestrial manifestation of the cosmic order, the divine organism, and castes were primarily spiritual, ethical, and cultural organs, as distinct from the economic “classes” of debased secular societies. Hence, corporatism was advocated by Evola as the traditionalist answer to class society. In the body every cell is subordinated to the general physiological Control, and we who will that Control do not ask whether each individual Unit of that Structure be consciously happy. But we do care that each shall fulfill its Function, with Contentment, respecting his own task as necessary and holy, not envious of another’s. For only mayst thou build up a Free State, whose directing will shall be to the Welfare of all. Hence Crowley, far from being a misanthrope, was concerned with freeing the individual from being part of a nebulous mass and providing sustenance for his material and thereafter cultural well-being as far as his nature allows. The deliberate cultivation of his image as “evil” must be viewed primarily as a perverse quirk, and in particular a result of his perverse sense of humor, his narcissistic personality, and his strict upbringing among the Plymouth Brethren, where he was delighted to have a mother who called him the Anti-Christ, which seems to have had a lasting effect on his thoughts and deeds throughout his life. Crowley addressed himself to a major problem for unorthodox economic and social theorists, that of the reduction of working hours when a new economic system had secured physical abundance for all, and freed humanity from the economic treadmill. Once the obligations to the social order had been met, there should be “a surplus of leisure and energy” that can be spent “in pursuit of individual satisfaction.” Sufficient amount of leisure time free from strictly material pursuits is the basis of culture, and a flowering of culture in the Medieval era for example was a product of this, coupled with the spiritual basis of society. What IS money? A means of exchange devised to facilitate the transaction of business. Oil in the engine. Very good then: if instead of letting it flow as smoothly and freely as possible, you baulk its very nature; you prevent it from doing its True Will. So every “restriction” on the exchange of wealth is a direct violation of the Law of Thelema. Under the Thelemic state every individual would be given the opportunity to fulfill his true will. Crowley maintained, however, that most true wills or “stars” would be content with a satisfying material existence, having no ambition beyond “ease and animal happiness,” and would thus be content to stay where they are in the hierarchy. Those whose true will was to pursue higher aims would be given opportunities to do so, to “establish a class of morally and intellectually superior men and women.” In this state, while the people “lack for nothing,” their abilities according to their natures would be utilized by the ruling caste in the pursuance of a higher policy and a higher culture. Machines have already nearly completed the destruction of craftsmanship. A man is no longer a worker, but a machine-feeder. The product is standardized; the result, mediocrity. . . . Instead of every man and every women being a star, we have an amorphous population of vermin. Before the face of the Areopagus stands an independent Parliament of the Guilds. Within the Order, irrespective of Grade, the members of each craft, trade, science, or profession form themselves into a Guild, making their own laws, and prosecute their own good, in all matters pertaining to their labor and means of livelihood. Each Guild chooses the man most eminent in it to represent it before the Areopagus of the Eighth Degree; and all disputes between the various Guild are argued before that Body, which will decide according to the grand principles of the Order. Its decisions pass for ratification to the Sanctuary of the Gnosis, and thence to the Throne. In Crowley’s blueprint of the corporatist state, each self-governing profession is represented in a “parliament of guilds.” This corporatist system was widely supported as an alternative to both capitalism and Marxism and was advocated by Evola and D’Annunzio, syndicalists, and Catholic traditionalists. It was embryonically inaugurated under Mussolini. Ironically from a Crowleyan perspective, Dollfuss’ Austria and Salazar’s Portugal embraced corporatism as applications of Catholic social doctrine. The Electoral College is selected by the King from volunteers who must show acumen in athletics and learning, a “profound general knowledge” of history and the art of government and a knowledge of philosophy. This corporatist and monarchical system was designed to “gather up all the threads of human passion and interest, and weave them into a harmonious tapestry . . .” reflecting the order of the cosmos. The Italian poet and war veteran D’Annunzio might have come closest to the Thelemite ideal with his short-lived Free City of Fiume, a regime governed by the arts that attracted numerous rebels, from anarchists and syndicalists to nationalists. Crowley does not mention D’Annunzio in his autobiography, even though Crowley was in Italy in 1920, and D’Annunzio’s enterprise ended in December of that year. Crowley quickly became disillusioned, however, and regarded Mussolini as a typical politico who compromised his principles for popular support. The mass nature of Fascism caused suspicion among many of the literati who had originally supported it, such as Wyndham Lewis and W. B. Yeats. Crowley observed developments in Rome for three days, and was disappointed with Mussolini’s compromises with the Catholic Church, which Crowley regarded as Mussolini’s “most dangerous foe.” Of course such criticisms are common among observers of events rather than participants. Critics from afar can afford the luxury of theorizing without having to test their theories, and themselves, in the practicalities of office. 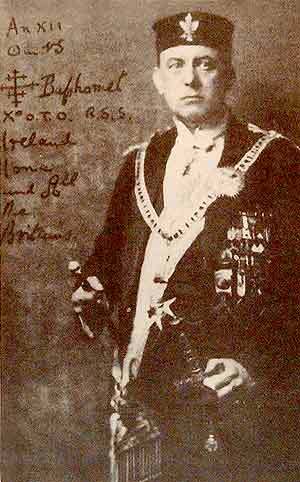 Crowley moved to Cefalu where he established his “Abbey of Thelema” in a ramshackle house. The death of follower Raoul Loveday resulted in Crowley’s expulsion from Italy in 1923, by which time he had become an embarrassment to the Fascist regime. However, one eminent individual who must have discerned a proto-fascist element in Thelema, before himself becoming one of the more significant spokesmen of Sir Oswald Mosley’s British fascism was J. F. C. Fuller, who achieved fame as the architect of modern tank warfare and as a military historian. Fuller had heard of Crowley in 1905, and was therefore one of Crowley’s earliest devotees. He was, like Crowley, a Nietzschean with occult interests who regarded socialism as a leveling creed: “the scum on the democratic cauldron.” His opposition to Christianity was likewise Nietzschean. Fuller met Crowley in London in 1906 and wrote Crowley’s first biography, The Star in the West, which was the winner (and only entrant) of a competition to promote Crowley’s poetry. Although Fuller’s interest in the occult and mysticism was life-long, he had broken with Crowley in 1911, embarrassed by Crowley’s escapades that drew blazing headlines from the tabloid press. In 1932 Fuller was still writing in Nietzschean terms of socialism and democracy as products of Christianity. Joining the British Union of Fascists and becoming Mosley’s military adviser, Fuller remained a lifelong Mosleyite, even after World War II, but refused any further contact with Crowley. While Fascists (particularly “clerical-fascists”), guild socialists, Social Crediters, Distributists, syndicalists et al. attempted to resolve the problems of the machine age, and Evola offered something of a practical plan in his Men Among the Ruins, Crowley’s Thelemic social conceptions remained as otherworldly as his mysticism, and few of his followers seem to have given much attention to the political implications or implementation of Thelema. We have to fight for freedom against oppressors, religious, social or industrial, and we are utterly opposed to compromise, every fight is to be a fight to the finish; each one of us for himself, to do his own will, and all of us for all, to establish the law of Liberty. . . . Let every man bear arms, swift to resent oppression . . . generous and ardent to draw sword in any cause, if justice or freedom summon him. The Law is for all, p. 101. The Law is for all, p. 321 Liber Oz. Crowley, The Book of Wisdom or Folly (Maine: Samuel Weiser., Maine 1991), clause 39, Liber Aleph Vel CXI. Nietzsche, Beyond Good and Evil (Middlesex: Penguin Books, 1991), p. 175. The Law is for all, p. 228. The Law is for all, p. 192. The Law is for all, p. 230. Crowley, The Confessions of Aleister Crowley (London: Routledge & Kegan Paul,1986), p.544. Crowley, The Law is for all, p. 281. Crowley, Liber CXCIV, “O.T.O. An Intimation with Reference to the Constitution of the Order,” paragraph 21, The Equinox, vol. III, no. 1, 1919. An Intimation, paragraph 12 and 13. Anthony Rhodes, The Poet As Superman – D’Annunzio (London: Weidenfeld & Nicolson, 1959). Anthony Trythall, Boney Fuller: The Intellectual General (London: Cassell, 1977).